Hook point for flooring, carpeting, vinyl and drywall. High carbon steel blades; precision ground angle sharpening for cutting ease. Non-slip comfort grip handles. Razor blade knife, utility knife. Designed to stand up to todays jobs! Retractable double-edge blade for controlling depth of cutting. Angular design handle for easy access to hard to reach places. Special angle out tip design prevents dragging off. Easy handling in confined work area only 6-7/8 tall. Stays in place even in high-traffic area. 3M Scotch Double-Sided Carpet Tape measures 2 inches x 36 yards and is used for holding foam and synthetic-backed carpets to a variety of floor surfaces including ceramic, vinyl and wood. It is designed for indoor use on smooth surfaces. 3M Rug and Carpet Tapes come in a variety of styles and sizes. Use them for holding rugs and carpets to a variety of sub floors, including indoor and outdoor carpets, artificial turfs, marine carpets, foam and synthetic-backed carpets. 3M Scotch Double-Sided Carpet Tape measures 2 inches x 10 yards and is used for holding foam and synthetic-backed carpets to a variety of floor surfaces including ceramic, vinyl and wood. It is designed for indoor use on smooth surfaces. 3M Rug and Carpet Tapes come in a variety of styles and sizes. Use them for holding rugs and carpets to a variety of sub floors, including indoor and outdoor carpets, artificial turfs, marine carpets, foam and synthetic-backed carpets. 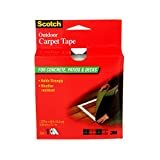 3M Scotch Carpet Seaming Tape is used indoors or outdoors with synthetic or foam-backed carpets or artificial turfs. This self-sticking, fiberglass reinforced professional carpet seaming tape comes on a roll that is 2-1/2 inches in width and 15 feet in length. No iron is needed. 3M Rug and Carpet Tapes come in a variety of styles and sizes. Use them for holding rugs and carpets to a variety of sub floors, including indoor and outdoor carpets, artificial turfs, marine carpets, foam and synthetic-backed carpets. 3M Scotch Reinforced Outdoor Carpet Tape is weather resistant and reinforced for added durability. It's ideal for boats, recreation vehicles, patios, decks and garages. Use it for outdoor installation of carpets and artificial turfs on wood, concrete, ceramic tile and other tile floor surfaces. This tape comes on a 40 foot roll and is 1.375 inches in width. It will not tear or stretch. 3M Rug and Carpet Tapes come in a variety of styles and sizes. Use them for holding rugs and carpets to a variety of sub floors, including indoor and outdoor carpets, artificial turfs, marine carpets, foam and synthetic backed carpets. 3M Scotch Professional Heavy Duty Indoor Carpet Tape comes on a 42 foot roll and is 1-1/2 inches wide. This tape is intended especially for heavy traffic applications and is ideal for kitchens, basements, bathrooms and porches. It's also recommended for large carpeted areas. Use it indoors with foam or synthetic backed carpets installed on a variety of floor surfaces including wood, concrete, ceramic and vinyl. 3M Rug and Carpet Tapes come in a variety of styles and sizes. Use them for holding rugs and carpets to a variety of sub floors, including indoor and outdoor carpets, artificial turfs, marine carpets, foam and synthetic backed carpets. 10 x 5/8-inch Brown Carpet Tacks, are in a 2-ounce package.